» Count to 1 million! » What do we have in common? Miss the 11-city tour last fall? Miss Brooke at Hotel Cafe? Miss Brooke period? Need some Brooke bling? Not to worry...you can get a piece of the memorabilia. Click on the t-shirt above to buy her merchandise! Click on the photo below to order the Secrets Of The Mountain DVD and CD soundtrack featuring Brooke's music! Becoming a member of Brooke's Bandwagon entitles you to post in the forums, win prizes and contests, and become part of a great community that supports singer/songwriter Brooke White, her music career and her many and varied efforts in the area of charity work. A. Nothing. Nada. A minute of your time. A great bargain. A. Where do we begin? Endless. A. Do you really need to ask? To help support one of the nicest persons on the planet, that's why! 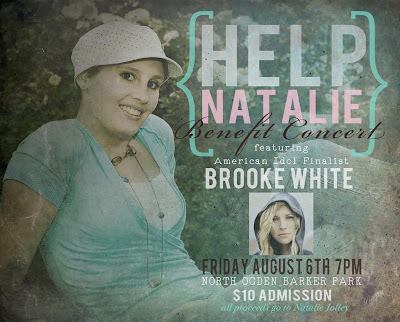 The Brooke White benefit concert to help Natalie was amazing! Welcome everyone to Brooke's Bandwagon, the official fan club for singer/songwriter Brooke White! Enjoy the music, the videos, the photos and the forums. Be on the lookout in the upcoming weeks for contests, prizes, merchandise and announcements regarding Brooke! Houston will ring in the holidays, when The Galleria hosts the 22nd Annual Tree Lighting and Ice Spectacular on Saturday, Nov. 13 at 6 p.m. at the recently updated ice facility, The Ice at The Galleria. A 55-foot Christmas tree, featuring 100,000 twinkling lights and 5,000 ornaments in a variety of colors and shapes, will light up the mall during the annual 30-minute tree-lighting show, Ice Spectacular. The holiday event will feature 2008 American Idol finalist, Brooke White; Houston-based Israeli sibling ice dance team and two-time Olympic competitors, Alexandra and Roman Zaretsky; and professional ice skaters Samantha Vonsiatsky and Richard Swenning. Singer Brooke White just completed High Hopes & Heartbreak, the first full-length release since she became an “American Idol” finalist in 2008. During the seventh season of “Idol,” the Phoenix, AZ, native drew rave reviews for her passionate swirl of willowing soul and ‘70s flavored gold. Alexandra and Roman Zaretsky, an Israeli sister-brother ice dance team who have competed on the international level since 1999 and participated in the 2006 and 2010 Winter Olympics. Together, they are four-time Israeli National Champions and two-time Olympic competitors. Hailing from Charlotte, NC, Samantha Vonsiatsky competed for eight years before turning professional at the age of 19. Samantha began performing as a soloist all over the world and has also completed three tours with "Broadway On Ice" where she shared the ice with many skating legends such as Brian Boitano, Nancy Kerrigan and Oksana Baiul. Richard Swenning has been engaged in professional figure skating since 1988. Richards’ career began as a principal soloist for the Ice Capades production of "The Best of Times". Richard’s reputation as one of the world’s finest male skaters carried him through an extensive 20 year principal skating career. In addition to the tree lighting event, there will be holiday entertainment beginning at 2 p.m. including strolling Dickens carolers, performances from area schools, face painting and balloon animal stations. Just in time for the holiday season, The Ice at the Galleria will boast a new and improved ice skating surface to provide skaters with premium quality ice. Off the ice, more than 600 new pairs of state-of-the-art rental skates will be available for customer rental. Additionally, skaters can expect to see a completely renovated skating center including new sound and video amenities and an upgraded party room for special events. Cadillac Ice Spectacular is free and open to the public. For more information, please call (713) 622-0663. Brooke did an amazing duet with Justin Gaston from the "If I Can Dream" reality show on the Wednesday, April 14 American Idol results show. You are listening to the studio version of this song now below. Enjoy! Brooke's music on NBC movie soundtrack! "Secrets of The Mountain," a made-for-TV movie produced by Randy Jackson, aired April 16, and includes a bonus CD soundtrack featuring music from Brooke, Jordin Sparks and Alisan & Ilsey. You can buy your copy by clicking on the photo at the left, which includes the movie DVD and the CD soundtrack for $12, exclusively through Walmart. It is also available now at the store. Congratulations Brooke on just a super fantabulous week for you! Try These from The Girls With Glasses on Vimeo. 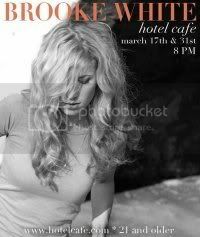 Brooke recently performed at Hotel Cafe in Los Angeles on March 17 and 31 and put on a couple of great shows! It's a wonderful venue just off Sunset in the West Hollywood area, which is Brooke's home turf. Many top artists in the Los Angeles area do the Cafe on a regular basis. The Cafe provides an intimate setting for artists and fans alike, the kind of place Brooke likes to play. Check out a few of the videos below of some of Brooke's work, including her new song "I'm Not Sorry." Brooke introduced at Miss America pageant, Jan. 30 ... she talks at the end. Let It Be, People's Court, Des Moines, Iowa. Brooke performs Radio Radio in Reno at Borders' Books, Sept. 19! Brooke talks with Jeff Rivera of The Huffington Post and plays him a song! Brooke hears "Radio Radio" on the radio radio!!! The official "Radio Radio" video by Brooke! The Facebook/U-Stream Concert from July! Rocking out to Guitar Hero from Brooke White on Vimeo. Want To Know More About Malaria No More? Click Here! Come join our Facebook page, too! Click on the Brooke's Bandwagon logo below to go to our Facebook page and become a fan! 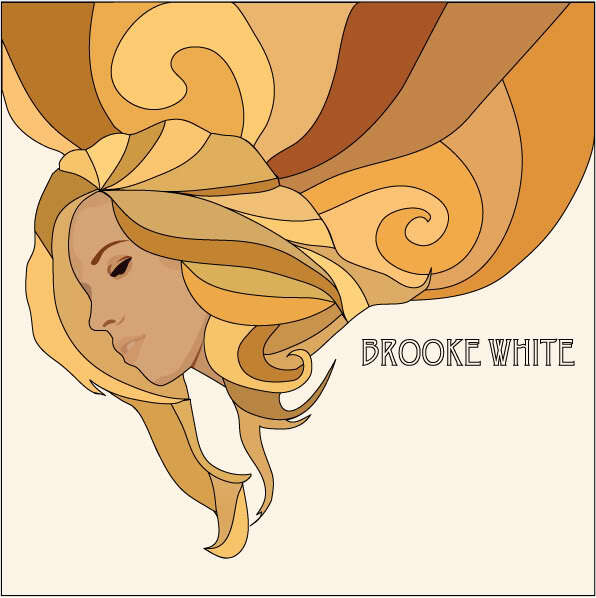 What's your favorite Brooke White song? Have fun voting among Brooke's most recent releases: High Hopes & Heartbreak, The Live Sessions EP, and the Christmas EP!